​Learning to read notes on the guitar can be very difficult! If you practice reading in the following way, you'll know all the notes on the guitar in no time. 1. 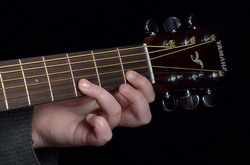 Before playing any exercises, say the name of the note and play it on the guitar. By giving yourself time to figure out the notes and saying the names of the notes out loud before you play them, you give your brain a better chance to learn the note. 2. After you're done with step one, write the names of the notes down on the page. If you're still having trouble figuring out which notes are where on the staff, this is a great time to practice without the guitar. Once you become good at reading the notes on the staff, you can skip this step altogether! It just takes a little practice. 3. Finally, when you did steps one and two, go ahead and play the song or exercise! It's important to play the songs and have fun once you figured out the note names. During this step, instead of focusing on playing the right note, you need to focus on making sure the rhythm is right! Different notes get different rhythms. For example, a quarter note gets one beat. If you practice your note reading in this way, you'll impress your friends and family with your musical talent! They will be proud of how hard you practice.